The Fourth » Kids 6 and under get in free! Kids 6 and under get in free! Of course those fortune tellers will probably be too busy telling you about strange men in the desert and other useless stuff. Regarding the comment below: I actually do SO MUCH. But we’re not here to talk about that, are we? Instead, let’s talk about this little tidbit of news from Disney. Some future-proofing: Don’t worry, Fourth fans! Our comic will be very, very different from this upcoming movie nonsense. But, there might be a few details that will be similar (how could we know, honestly), so trust us; we didn’t copy anything. I really, really love that first panel. And that billboard panel. Yeah, I’m just quite happy with this page overall. I never realize how much paperwork goes into maintaining a dungeon. Ideally, yes. 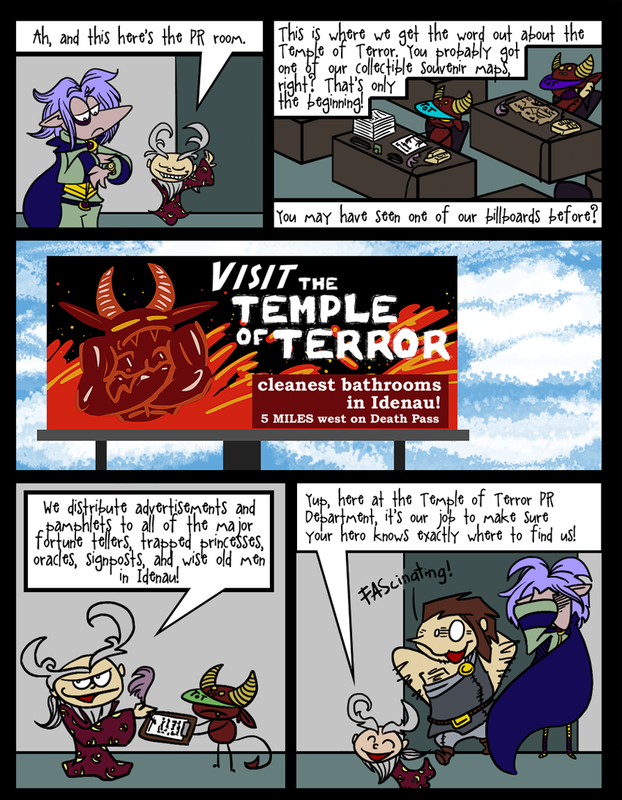 The Temple of Terror is a little backwards, it seems. Then again, they’re not alone: haven’t you played a game – ahem, “been on an adventure” – where everyone seemed to know where you were supposed to go next? Looking at this comic, I must say my favorite characters are the minions overall.